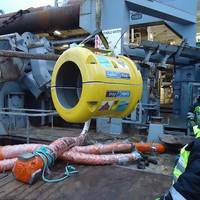 Lankhorst Euronete SA is supplying fibre mooring ropes to Global Maritime Consultancy & Engineering for construction of the world’s largest fish farm near the island of Froya, offshore Norway. The new concept fish farm is a pilot facility developed by Ocean Farming, a subsidiary of the SalMar Group. 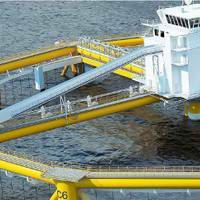 The aquaculture facility comprises a slack anchored, semi-submersible structure, permanently moored at a water depth of 300m by eight 130m polyester mooring lines. Each mooring line is made up of an anchor and two lengths of rope, joined by a H-link. The innovative KO-LINK towing ring, developed by international maritime service provider KOTUG International BV, is now available exclusively from leading maritime ropes supplier, Lankhorst Ropes, under a worldwide marketing agreement. The KO-LINK ring significantly increases synthetic towing line service life by preventing the HMPE pennant from cutting through the line. KO-LINK is a highly polished, lightweight, aluminium ring, which is inserted and attached to the splice eye of the towline. Heavy lift operations offshore are an awe-inspiring feat, but an operation that requires consistent monitoring of man, machine and procedure to ensure they are conducted in as an efficient and safe manner as possible. Due to a growing focus on safety related to subsea lifting operations, DNV GL recently established a Joint Industry Project (JIP) to develop practical methods for reducing the risks and lifetime cost of steel wire ropes for subsea lifting applications, using an integrated systems approach. WireCo WorldGroup Inc., the world’s leading producer and marketer of specialty steel ropes and high synthetic ropes, announced today that WireCo has acquired the assets of Endenburg B.V., a Netherlands-based company. As part of the agreement, WireCo will establish a crane rope distribution center at the current Gouda location, called the WireCo Crane Center. 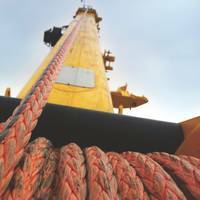 Founded in 1855 and headquartered in Gouda, Netherlands, Endenburg supplies hoisting and lifting gear including steel wire ropes, shackles, fiber ropes and custom-made tarpaulin covers for the shipping, towing, construction and transport industry. The Endenburg name will not be continued and all activities will be incorporated into current WireCo business units. 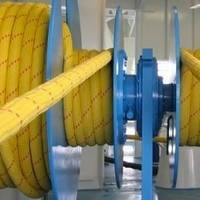 Offshore rope manufacturer, Lankhorst Ropes has been awarded a contract by Aberdeen based Dana Petroleum to provide Gama 98 polyester mooring lines for the Western Isles Development FPSO vessel (Floating Production Storage and Offloading). Given the weather conditions in the North Sea, and relatively shallow water depth, the cylindrically shaped FPSO will use a semi-taut leg mooring system. It will be moored with 14 polyester mooring lines in three clusters of 4, 4 and 6 lines at 250m water depth. Lankhorst Ropes wins Seatralde 'Innovation in Ship Operations' award for its Tipto Winchline which reduces crew risk of being struck by a parted mooring rope. A snapped mooring rope is, thankfully, a rare occurrence, but when it does happen the results can be devastating. 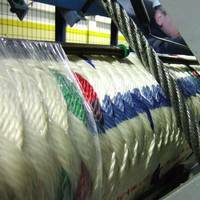 Using its expertise in yarn production and rope construction, Lankhorst Ropes has developed the Tipto Winchline to provide a safer mooring rope. Based on Lankhorst's Tipto yarn, the seven strand rope features a Tipto overbraided jacket to protect the rope from wear and tear during handling. 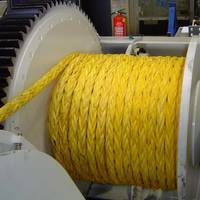 Ropes manufacturer Lankhorst Ropes Offshore Division expanded its range of high performance mooring and anchoring ropes to include steel wire ropes for the offshore market. The company is now able to offer both synthetic and steel wire ropes for mooring and anchor systems, as well as towing, crane lifting, riser tensioners and drilling applications. Initially, Lankhorst will supply six-strand, eight-strand and multi strand (non-rotating) steel wire ropes direct from WireCo WorldGroup factories in Germany, U.S., Mexico, Portugal and Poland. 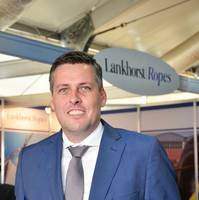 Lankhorst Ropes Offshore Division (LROD) announced the latest results of offshore trials of its Lankofirst synthetic fiber rope mooring connector on booth 1517 at OTC 2013. The trials have shown a significant reduction in mooring line deployment times and improvements in health and safety using the Lankofirst connector, compared with traditional mooring line plate links and thimbles. The Lankhorst booth will also feature the ultra-low creep HMPE mooring rope made with Dyneema for permanent deepwater moorings beyond 2,000m water depth, and Lankhorst Mouldings' buoyancy modules for fiber rope mooring lines for the Goliat FPSO project. Lankhorst Ropes Offshore Division is undertaking a research project into the development of cut resistant jackets for mooring ropes in the Norwegian and Barents Seas. The project will be used to assess materials needed to reduce the effects of fishing trawler lines on synthetic fiber mooring lines. Deepwater moorings, beyond 800m, in the Norwegian and Barents Seas are subject to extreme weather and wave conditions. 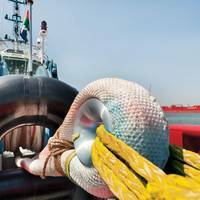 The synthetic mooring ropes must provide high abrasion resistance and be immune to the effects of external damage arising from trawler activities. Leading deepwater rope manufacturer, Lankhorst Ropes, has secured the first-ever, worldwide order for Dyneema synthetic mooring rope for deepwater MODU (Mobile Operating Drilling Unit) projects from Brazilian oil and gas producer Petroleo Brasileiro SA (Petrobras). 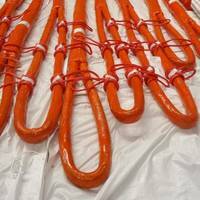 Gama 98 is a rope construction developed by Lankhorst Ropes specifically for deepwater mooring, and used on a number of major deepwater projects in the Gulf of Mexico. 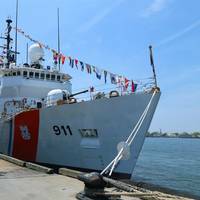 The rope will feature up to 12 Dyneema SK78 yarn sub-ropes. 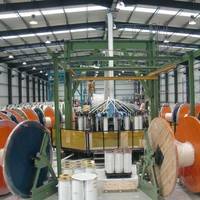 Developed by DSM, Dyneema SK78 is a high modulus polyethylene fibre. 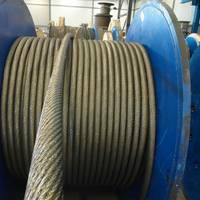 Leading deepwater rope manufacturer, Lankhorst Ropes Offshore Division has invested Euro 2M in a synthetic fibre rope test machine that, for the first time, will enable naval architects to run 'what if' scenarios to simulate the effects of storms and hurricanes on deepwater mooring lines. Located at Lankhorst Ropes’ fibre rope production facility in Portugal, the rope test machine will be used to test the mechanical performance and fatigue behaviour for a range of new materials and rope constructions for deepwater mooring and single point mooring (SPM) systems. The machine can test 20m ropes with loads up to 1,200 tonnes and a stroke length up to 4.5 m.
Research Winches for R/V Maria S. Seven special winches were supplied by Hatlapa in December 2003 after being tested and demonstrated in the factory. These winches are intended for the new research vessel Maria S. Merian, which will support the vessel Polarstern during operations in the Arctic. Hatlapa has escorted this project for five years, during which time the design of the winches was formed in close cooperation with the order principal BAW (Bundesanstalt für Wasserbau) and the shipyard Krögerwerft in Rendsburg. 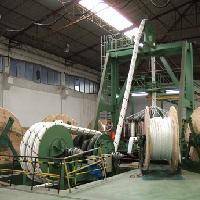 One specialty is the combination of friction and storage winch for handling the very long and relatively thin measuring cables. 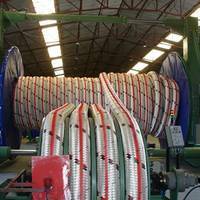 The advantage is that the sensitive and expensive research ropes can be spooled on the storage winch free from load.